This was shot near Charlottesville, VA after Look3 festival. I go to Look every year and it's something I really look forward to. Having community in photography is incredibly important to me. I grew up in skateboarding culture which is a super tight-knit community. Since photography is a bit more of a solo endeavor, it's easy to get lost in your own head if you don't have community to get feedback from, and help process the way you think about approaching photography. I think we can kind of drive ourselves crazy, because photography is both thought driven and very subjective. That combo would drive anyone insane without having some help to process it all. We need some kind of reference point to decipher what is good, what we like, and what ideas are worth pursuing, and the photo community that I've cultivated through APAD, Look3, TID, and Lovebryan has helped with that. I usually don't shoot at Look3 much, and this year I didn't take my camera out once. I'm really not someone who just carries my camera around all the time, I wish I shot daily life more, but I don't. For me, it's a very deliberate switch that has to happen for me to get into photo mode. I'll get more into that later. But this was a moment I wanted to document, because it was a beautiful scene and I was so happy to be spending extra time with these folks after the festival. The people in the foreground of this image are some of my favorite people in the world and greatest inspirations in photography. More on them later as well. As we begin, can you talk about your approach to making images, and how you mentally work to make people feel comfortable in your presence? In most cases when I'm shooting there is a particular purpose to what I'm shooting, and so my mind is split between thinking in the moment, and thinking about how the images I'm making relate and tie in to the overall theme I'm working on, and what details I can incorporate to help tell that story. I enjoy thinking in that way, but it's also fun to just shoot to shoot, so that I can give all of my mind to the execution of the image. The less you are thinking about, the better you can pull off each element of a good image. So with an image like this one, I'm not too worried about any kind of thematic or over narrative concepts, I'm just trying to watch my layers, and trying to watch the foreground and background at the same time to look for a good moment in both scenes. I know when I'm shooting at small apertures as was the case here, it's way more important that everything is right and there is something worth looking at in every part of the frame. I was actually more focused on the background here, which is where the camera is focused, using the foreground more as a framing element, but I needed some kind of moment or interest in the foreground to be happy with it. As far as my approach to making people feel comfortable, I think it has a lot to do with feeling confident and sensitive, but unapologetic about what you're doing. If you are nervous about taking photos of people, it may mean that you don't have a solid understanding of why you are doing it, or you feel like you are taking something from people. I too get nervous sometimes at first interacting with people, but I don't feel bad about taking their pictures, and I feel solid in where I'm coming from with photography. If you are comfortable with yourself behind a camera and don't act like you're getting away with something or doing something wrong, then other people will be comfortable. Nervous energy in contagious as is any kind of energy, so you have to put out what you want to get back. I'm comfortable in the presence of my friends or with total strangers. I'm comfortable with people that are very different from me, so I think that's why they tend to be comfortable with me. You have to read the scene and know how you fit into it as a photographer. Sometimes I feel the need to interact a lot as I'm shooting and take the camera away from my face as much as I can so Ican have eye contact and connect with people, other times it's the opposite and I just try to disappear as much as possible because it's not my moment. It's someone else's moment and my part in it is to minimize my presence and preserve if for them and for myself. I have had very few major turning points in my approach to photography, yet my approach is significantly different year-to-year. So it's a slow moving thing that is a culmination of various influences. It's good to know what's influencing you as you change your approach, because that's a good way to keep yourself in check. I have always tried to keep some distance from being influenced too much by popular culture and photographic trends, but it's totally inevitable. It's just something I try to keep tabs on. I always wonder how much of me is inherently me, and how much is just me playing a roll to fit in to society or whatever culture or sub-culture I resonate with. I know that's very college Psych student of me, but it's important to me. I don't think there is anything wrong with being a part of a 'tribe' or trying to fit in, but sometimes it gets in the way of your own voice. That's why it's important that if you notice yourself changing as a photographer, it's good to analyze where that change is coming from. For me, it's just so I can feel some sense of being in charge of my own decisions. When I see a whole lot of people doing the same thing and can see that it will be tied very closely to that particular time in history, I try to avoid it. I prefer images that can exist in any time period and still be good. Lots of photographers have achieved that before me, and it's what I strive for. 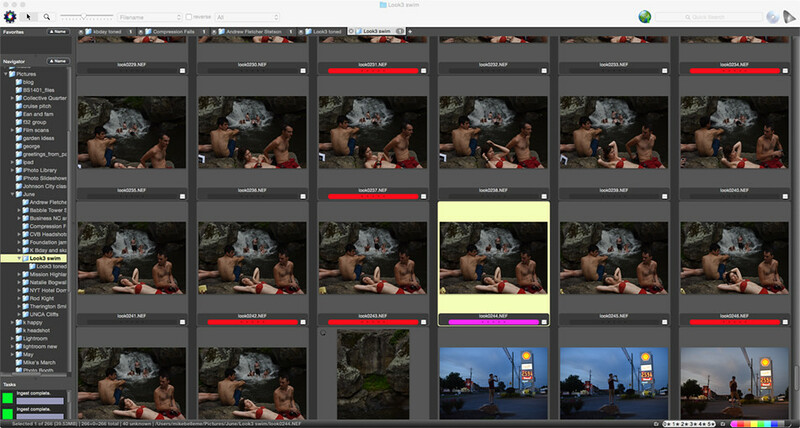 As I've developed, more and more of my photos are layered. I don't mean that in the compositional sense. I just mean that they are more complex. The stories that I'm drawn toward now and all about complexity. Our brains want to simplify things, and I like to combat that, but showing that there is always a grey area. We all compartmentalize in our mind constantly. We categorize everything we see as good, bad, cool, lame, black, white, right, wrong, it's our brains way of processing the world, but it often leads us down the wrong road. I aim to create images and stories that un-polarize our minds and make us think deeper beyond what we expect to see. We need more of that. The #everydayafrica thing that Peter DiCampo started is all about that too, which I think is awesome. Show people what they don't expect to see and challenge their perceptions. Shatter their constructs and make them rebuild. Can you talk about the importance of documenting your own life? I have never been good at it, and I've always been impressed with people who make striking images stemming from ones daily life. Honestly I wish I was better about it too. 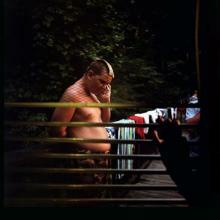 I see people like Matt Eich who always has his camera and shoots constantly, and I envy that. It is very important, but I always feel like I have to weigh that against being in my own life and living in the moment. I don't know what it's like for anyone else, but for me, getting into the photographic mindset is a removal and is a distinctly different experience than if I don't take the camera out. I don't take cell phone photos, so I haven't gotten into the mode of being the casual photographer. If I pick up the camera, then that's usually what I'm doing for a while, because it's not easy to just switch that on and then switch it right back off. As much as I enjoy photography, within my own life I consider it someone of a compromise of the current moment for something that I'll be glad to have later. Often though, my mind is going to go to that photographic mindset whether or not I have a camera. I always have at least one foot in the photo mind, but when the light is just right, or a moment is perfect, it takes over and I'm only seeing the scene through the eyes of a photographer. That's a frustrating time to not have a camera on hand, so I always try to at least have it close. I think transitioning to shooting and back to not shooting is the only hard part for me. If i'm having a great time with friends, family or my girlfriend, I'm going to be enjoying myself either way, but I will remember it a whole lot better if I'm shooting too. I recently made a book of my life together with my girlfriend, it actually ended with the words "will you marry me?" so obviously it was a significant gesture. Those photos in that book are my favorite I've ever taken and the most important work I've ever done without a doubt, so it was a good reminder that it's worth it to shoot your own life even if it involves some mental gymnastics at times. Now, onto the moment. 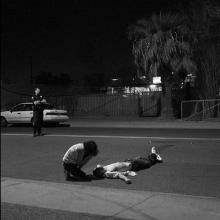 Please walk us through how you photographed the moment and what was going on in your mind. On a side note, I think it's so interesting that the subtle shift in her arms makes such a big difference between it and the frames before. Like I mentioned before, I'm mostly watching the background here. My first thought was "Speak no evil, hear no evil" but I wanted someone covering their mouth too. It's so strange. 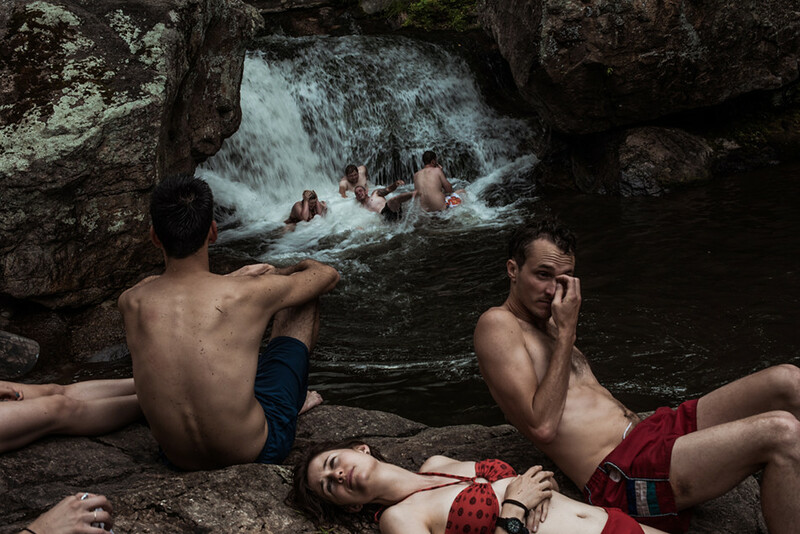 The woman on the left is adjusting her bathing suite, the guy in the middle is trying to get water out of his ear, and the one on the right is trying to get something out of his eye. They are all uncomfortable in some way and trying to figure out how to get remedy their various situations. Even Erin in the lower part of the foreground seems like she has some tension in her face or discomfort. I like that the outdoors are kind of uncomfortable, It's good for you to feel uncomfortable sometimes. That's stuff I think about after shooting though, not in the moment. Maybe someday I'll be able to split off part of my brain to reflect about how this is a photo about addressing our human disconnect from nature by showing various types of discomfort while I'm shooting, but probably not. My mind is mostly occupied by the finer points of composition as I shoot. Compositionally, I was working with the circular nature of how the scene was laid out. I like the textures of water and rock and skin, so I shot a small aperture to make it about the textures more. I also like shooting these water scenes kind of dark. 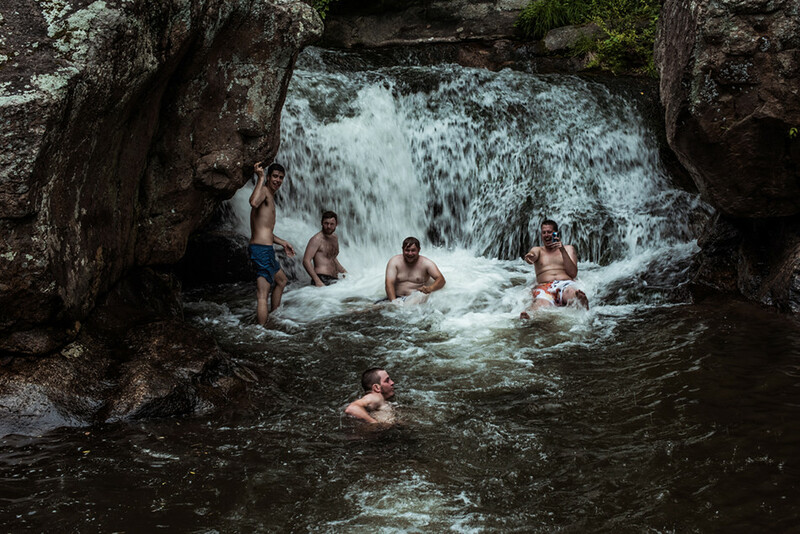 You get such rich tones out of swimming hole photos. 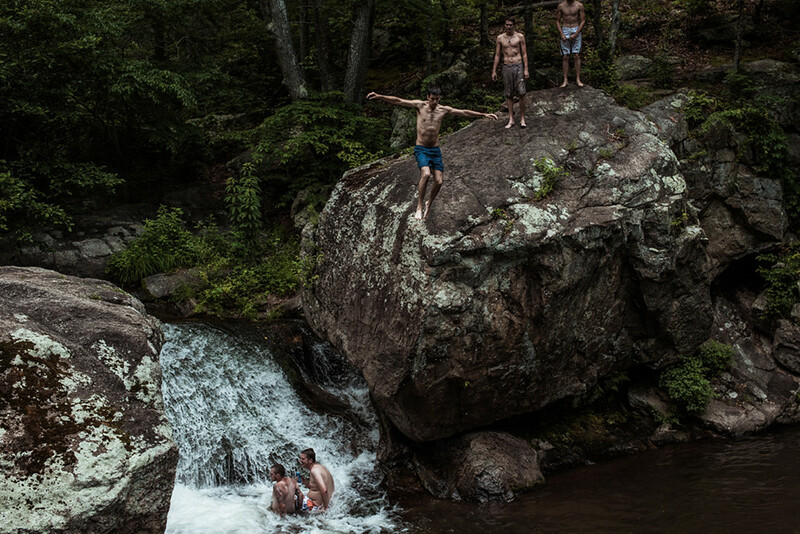 I think I actually picked that up from Chris Anderson from a photo that he shot of his wife at a swimming hole. I saw it several years ago at Look3, so it's all full circle, just like the photo. Did you have any issues/problems which making this image and if so, how did you work to overcome it? I'm always impressed with how people problem solve. Not really. I wanted everything with this image. Any time you are working with layers, you just have to compose the photo right and hope for some golden moment to unravel in front of the camera. It's just about patience. In a lot of the photos I shot, Phil didn't have his face turned toward the camera, so that was helpful that he turned. This one worked out pretty well, but it could have been so much better. Maybe if there was an explosion in the foreground or something (a safe explosion that didn't hurt anyone). We should have brought fireworks, but given my limited resources at the time, I'm happy with the photo. In conclusion, what advice do you have for photographers? Do you have any other people you look to for inspiration? I love giving and receiving advice. I've had so many great mentors in my life and I love passing on their wisdom to others. My favorite advice I've ever gotten, was to take time to develop your own vision before you go tweaking it too much, to fit the needs of a market. If you develop your vision with the satisfaction of a client in mind, you will never have a voice of your own. That doesn't mean you have to never take work in the beginning, it just means that you have to understand what your own vision is, and then you make a conscious decision each time you collaborate with a client about how much of yourself you are putting into it and how much you are incorporating the vision of the client. The more distinct your vision, the more people will come to you specifically for that and you won't have to compromise at all. I'm not there yet, but I certainly do know what my vision is and when I'm compromising it. That advise came from my first photo mentor, Jon Menick. One of the most important things to think about when getting into photography is what you're going to shoot. It's important to have personal work, but sometimes hard to decide what to shoot. I've mostly focused on things that are very close to me that I know a lot about, and so I'm the perfect person to tell the story, or things that are very distant to me, that I don't understand and that I want to understand better or learn more about though documenting it. Over the years as you shoot more and more, if you are truly shooting for yourself and not just because you think other people will be interested, you will see these thematic threads emerge that connect each story even if they seem totally different. That's when it gets really fun and interesting, when you are working on fleshing out deeper themes throughout multiple projects. As for inspiration, I find it every day in all kinds of things. Seriously though, the three people in this photo we're talking about are some of the biggest influences I've ever had. Tim Hussin, right, is one of my favorite photographer, he was before I ever met him, but since I've become close friends with him now, he's only impressed me more. He lived in my hometown of Asheville for a while several years ago and it was amazing getting to pick his brain and get feedback from him on a daily basis. Erin is also one of my favorite people on the planet. 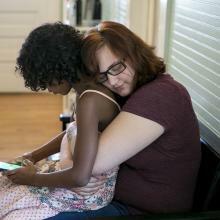 I don't think anyone who has ever met Erin doesn't adore her, but I think what I've learned most from her is about approach. I love the energy she brings and her inquisitive nature that comes through in her work. She also thinks outside of the box about how to make communicate though photography in ways that aren't all about us as photographers, but more about the people who really need to see it. She's great at engaging the community in a dialog. She was my main photo buddy in Asheville until San Francisco stole her from me. Erin and Tim recently started dating which is awesome, because I love them both and it makes sense that they would love each other. Phil, on the left, the rising star in the photo world, has also been a big inspiration for me lately. Every time I see his work, I am reminded of the importance of believing in your own vision. Phil shoots like Phil. You want Phil, hire Phil cause that's what you're gonna get your fill of Phil. That's what I've always wanted for myself, but don't quite have the balls to pull it off yet. I think about him when I go out on shoots though, cause I shoot for some of the same clients, but tend to shoot safer images for them. Phil reminds me that these people are actually hiring you mostly because of what they've seen you do, and they want you to do that for them. Lots of my biggest influences are people I know. I look at my share of photo books, and study up on the work of the legends, but I don't think I'm that heavily influenced by them. I do steal from some of the greats when I approach lit portraits, mostly Dan Winters, but mostly it's my friends who inspire me. Bryan Derballa is the person who's been the biggest part of my development. We started around the same time, and had been super close for years before that. We have continued to have several hour long nerd-out sessions on the phone about once a week for the entire time that we have been into photography so I think we have rubbed off on each other quite a bit. 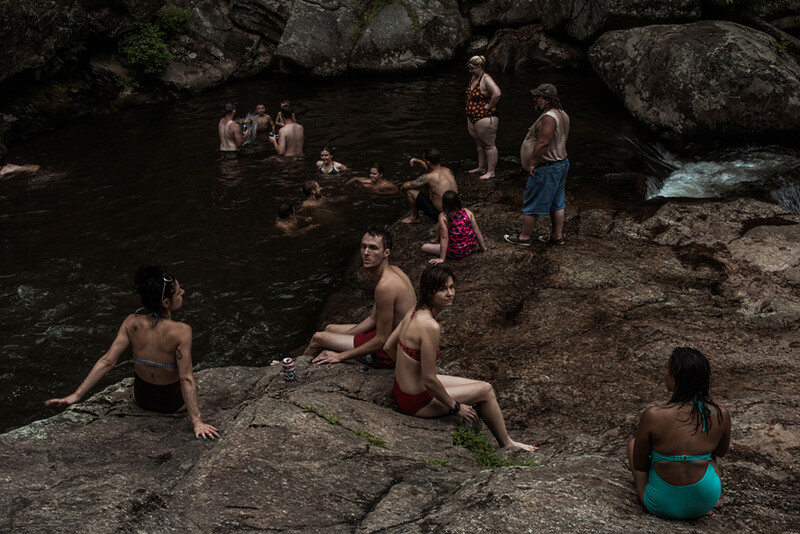 Mike Belleme is a photographer in the beautiful mountains of Western North Carolina where he was born and raised. He enjoys the challenge of creating thought provoking and visually impactful images, whether they are part of long-term documentary projects, portraits in or out of the studio, or collaborating with clients to modify his vision to best suit their purposes. He feels a very strong connection to the people and ecology of this part of the country, and photography has been a great way for him to explore that deeper. Clients include New York Times, The Wall Street Journal, Fortune, CNN, MSNBC, Time.com, Wired, Huck, American Giant and Stetson.